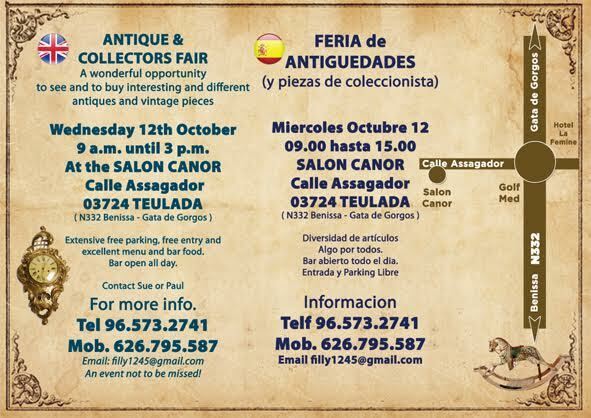 Lovely, well established Antiques Fair at Salones Canor, Calle Assagador, 03724, Teulada. Wednesday the 12th of October (National fiesta day) is the day, 9a.m. to 3 p.m.
You will find antique, vintage, retro and collectables in abundance. The venue is elegant, indoors and has AC or heating depending on the weather. Parking is extensive and entry and parking are free of charge. The bar is open all day for bar food and drinks. This elegant venue has it all including attractive gardens and is a perfect day out. You can help support your favourite charities as we donate tables to EMAUUS, AKIRA and The Lions of Calpe and Benissa who are selling items that have been kindly donated by their loyal followers. Any enquiries to Paul or Sue, who are delighted to hear from you at any time, on 965732741 or 626795587.